The full Trident fleet won great acclaim at the Guangzhou Auto Show 2018, with the China debut of the powerful Maserati Levante GTS, the presence of the legendary classic model Maserati 3500 GT, Quattroporte, Ghibli and Levante. Embedded with a high-performance twin-turbo V8 engine, the new Levante GTS becomes a new exemplar of the brand's GT philosophy with no compromises in terms of strong power, pure Italian design, and peerless comfort, enticing beholders to embark on another great journey with speed and style that only Maserati can offer. Next to the new Levante GTS stood the Maserati 3500 GT. This refined model is not only an eye-catching masterpiece of Maserati classics, but also a proud showcase of the brand's GT philosophy. The original concept was enchantingly simple, which involved fitting a sophisticated race car engine into a luxurious, handcrafted sedan. Seamlessly combining these two attributes is undoubtedly a great challenge for any car manufacturer and is exactly what Maserati did with the 3500 GT almost sixty years ago. As a brand pursuing extreme sportiness and performance, Maserati enjoys pushing performance one step further with the help of its V8 engines. From the Sebring 12-hour Class C Winner 450S racer launched in 1956 and the first generation of Maserati Quattroporte launched in 1963, to the 2001 Coupe model co-designed with Ferrari, the V8 family has played an indispensable part in the history of Maserati as proof of unmatched sportiness and dynamics. Now the Maserati V8 family has brought in new blood as the Levante GTS roars to life equipped with a powerful V8 engine showing the unwavering GT Philosophy - to travel great distances fast, in comfort and style. Combining the powerful V8 engine and the GT philosophy with the first SUV in Maserati's history for over a century, this quintessential SUV is an embodiment of Maserati's innovation and heritage, raising Levante's luxury and performance to a whole new level. 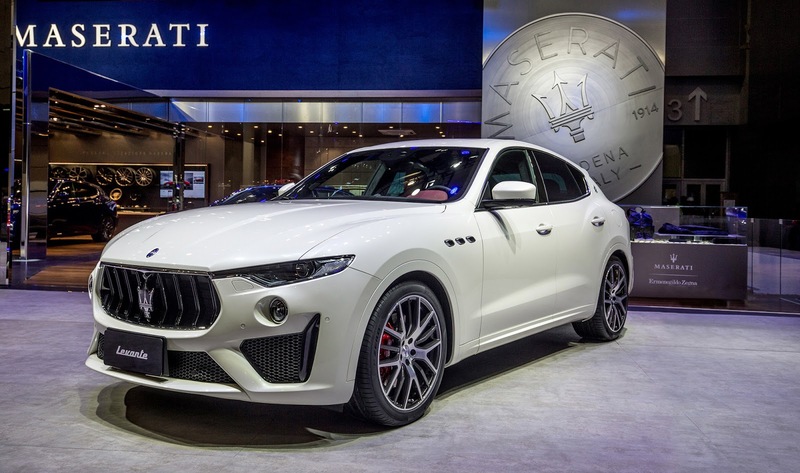 As one of the most capable and exclusive SUVs ever built, the new Levante GTS is equipped with the mighty twin turbo V8 engine, which pays tribute to Maserati's racing heritage and classic models. Like all Maserati engines, this V8 has been developed by the Maserati Powertrain in cooperation with Ferrari, and is handcrafted in its Maranello factory. The 3.8-litre V8 engine is one of the most powerful engines ever placed in a Maserati, delivering a momentous 550 hp and 733 Nm peak torque. The new Levante GTS sprints to 100 km/h in only 4.2 seconds, with a top speed of 292 km/h. The powertrain calibration allows this stunning and powerful machine to produce Maserati's signature engine sound. With such strong performance figures, the new Levante GTS is still able to offer surprisingly effortless handling with the help of a redesigned gearshift lever that has a more intuitive shift pattern enabling shorter travel and improved operation. These features fairly describe a modern supercar beautifully disguised in a high-end SUV body. The unmistakable Levante design has reached new levels of sportiness in the GTS version, with many exterior updates compared to the Levante. Viewers' eyes are drawn to the sleek and muscular front where the arching front wings bear the iconic triple air vents. Thanks to an elegant restyling focusing on a chromed front grille with double vertical bars and chromed perimeter, lower honeycomb mesh fascia and the rear bumper, the new Levante GTS comes with a sportier and even more sophisticated presence. The standard Full-LED Adaptive Matrix Headlights illuminate the road with a powerful presence. The elegant restyling emphasizes the rear end and makes it look wider and more muscular, with a sharper horizontal element and a body-coloured lower extractor embracing the oval quad exhaust tips. The rear extractor, consistent with the lower front splitter, is also body coloured, and combined with Black Piano inserts in the front and the rear bumper, gives the new Levante GTS a subtly sporty look. A wide selection of sizes, material, and colours of wheels and callipers, present great customization possibilities, giving this model a special personal touch specific to its owner. The theme of luxury and unmistakable richness continues everywhere else in the cabin with high-end touches added from front to back. As an option, sumptuous full-grain "Pieno Fiore" natural leather is available in three colours (black, tan, red) with specific stitching on the seats and new double stitching on the door panels. For audio aficionados, an optional 17-speaker Bowers & Wilkins premium surround sound system provides concert-like audio throughout the cabin. Also on display was the full Maserati fleet, which includes the dazzling Quattroporte, Ghibli and Levante, all furnished with GranLusso trim. It redefines the concept of luxury and comfort on the road, and yet does not compromise in terms of power and handling. It resonates with Maserati's GT philosophy, which the brand has relentlessly inherited over the past one hundred years. The pursuit of extraordinary powerful performance and ultimate luxury has been elegantly balanced in every model that bears the mark of the Trident. The new Maserati Levante GTS starts at RMB 1,598,000 MSRP.